Fousia, who happened to live in the house next to Karuna’s, was hanging out the clothing on the roof when she noticed that there seemed to be some sort of celebration taking place next door. A bunch of women were talking and laughing over tea. They looked like they were having a lot of fun. Over time, Fousia began to notice that these “celebratory teas” were taking place quite often. She couldn’t help feeling curious — and a little envious of the camaraderie the women shared. Her husband supported her, for it sounded like a nice social group for women. In fact, more than the financial need, Fousia was craving connection and friendship. “Before I joined Amriteshwari SHG, I didn’t know any of my neighbours”, Fousia relates 10 years later. “Now I have so many friends in the community”. Not knowing one’s neighbours is not, in fact, unusual these days. Unlike in previous generations, when communities were more closely knit, most people in this town did not know any of their neighbours. Now that everyone on both sides of the street has become a member, however, the neighborhood is bonded by fellowship. This fellowship, the group discovered after some time, was composed of four Hindus, four Muslims and four Christians. “Only after a long time did we discover it was like this,” Karuna relates. “Very naturally, we began to celebrate all of the festivals. On Christmas, we exchange gifts.On the Muslim holiday of Eid, Fousia makes a big meal for everyone. And for the Hindu Onam celebration, the husbands help with all the cooking and serving”. Indeed, holidays have become a family and neighborhood affair. But not all is fun and games. Husbands may cook and serve, but sometimes they need help, too. 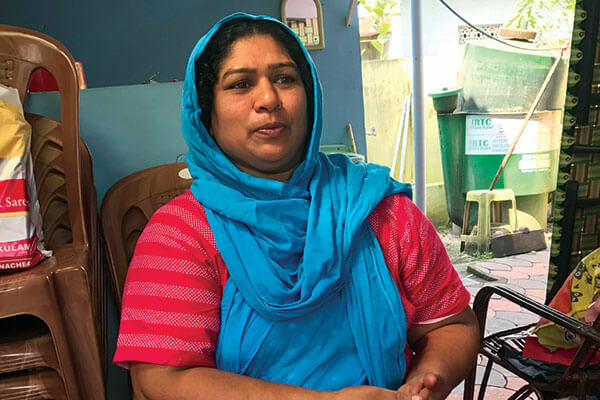 When Fousia’s husband’s rickshaw suddenly needed 10,000 rupees worth of work done, he began to realize that the SHG was much more than a social activity.